Since 1987, the Dranoff International 2-Piano Foundation has been the world’s leading organization to champion exclusively two piano repertoire and artistry. It is the only international foundation recognized by the World Federation of International Music Competitions, to discover, promote, and award honors to top professional duo piano artists through its competition, commissions, and presentations of duo piano concerts. 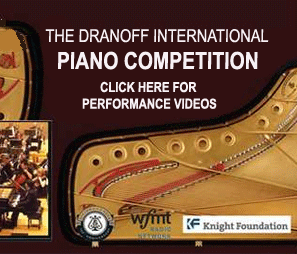 The Dranoff International 2 Piano Competition cycle spans 18 months and features top scholars and performers as judges of young artist applicants vying for cash and performance awards. Two piano artist teams must prepare four hours of repertoire for four rounds of competition. The Dranoff Competition begins with the seating of the Competition Committee which establishes the competition rules, selects the juries and commissions a new 2 piano work from an internationally prominent composer. Competition Applicants’ first step is to a 45-minute, unedited DVD of an original audition performance. It may not be a recording of a prior performance. Winners selected from this round go on to the Regional Live Audition Rounds which take place in a music and cultural capital of the Americas, Europe and Asia. From this pool, ten teams are selected to travel to Miami for the Semi-Final and Final Rounds. Miami, FL – The jurors of the 12th Dranoff International 2 Piano Competition have awarded the Gold Prize to Duo Yamamoto. The winning duo team, sisters, Ayaka and Yuka Yamamoto, of Japan, performed Francis Poulenc’s Concerto for 2 pianos and orchestra in D minor. The Silver Prize has been awarded to Duo Yoo and Kim of South Korea, and the Bronze Prize has gone to Duo ImPuls of Germany. The three competing teams performed with conductor Sarah Hicks and the Dranoff Competition Orchestra at the Gusman Concert Hall on the campus of the University of Miami. The prizes awarded for Gold, Silver, and Bronze Awards are $25,000, $15,000 and $10,000, respectively. Each day the audience in attendance for the semifinals voted for their favorite teams. The Audience Prize ($1,000) also went to Duo ImPuls. 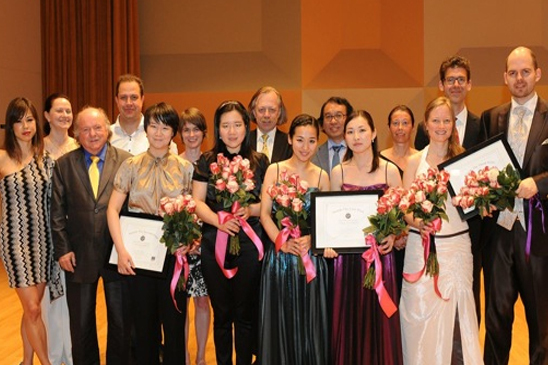 Sarah Hicks, Conductor; Aglika Genova (Artistic Director, with her husband Liuben Dimitrov); John Perry, juror; Liuben Dimitrov; Jaekyung Yoo (with Yoon-Jee Kim the Duo Yoo & Kim); Kate Monaghan, juror; Yoon-Jee Kim; Dr. Bernd Goetzke, juror; Ayaka Yamamoto (with Yuka Yamamoto the Duo Yamamoto); Professor Wu Ying, juror; Yuka Yamamoto; Chloe Herteleer, juror; Barabara Bartmann (with Sebastian Bartmann the Duo ImPuls); Ben Schwartz, juror; Sebastian Bartmann.